If you’re dreaming of learning exciting new skills to lead a healthy & eco-friendly life, this is the program for you!! Every season, you’ll learn about a brand new topic about low waste toxic-free living! This Spring, we’ll start with the foundations of low waste living, and then jump into green cleaning minus the greenwashing B.S (and yes, this includes the newest edition of our ebook designed by Eco with Em!). In the Summer, you’ll learn all about Zero Waste Body Care & Cosmetics, with everything you’ve wanted to know about skin care, hair care, dental care, etc. In the Autumn, you’ll learn about Zero Waste Menstruation and Herbal Remedies for Common Ailments. And in the Winter, you’ll learn about Growing Sprouts & Microgreens at Home, about Secondhand Living, and Environmental Activism. The school includes ebooks, quizzes, checklists, online support, and a ton of bonuses! Do you have about a million questions right about now? 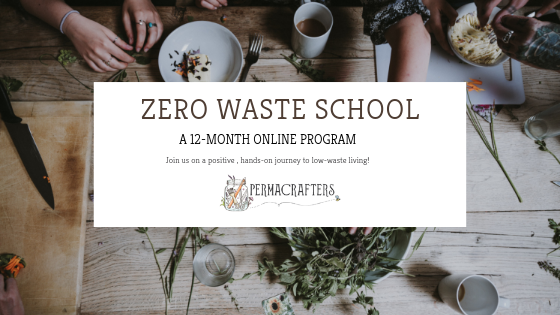 Jump over to the Zero Waste School Info Page for all the details. Get the early bird special if you sign up by April 15th! We can’t wait to have y’all join this program & spend an incredible year learning together!